There is perhaps no better symbol of globalization of the service economy than a customer service Call Centre from United States that gets answered in India or any other country worldwide. Here is the Step by Step Guide to start a call centre. A call centre is a service company in which the company’s inbound calls are received and outbound calls are made. The culture of call centre is becoming an upcoming trend in the recent social economy of various countries. Call centers are often large offices which employs large number of staffs or representatives to attend the phone calls and to serve for the customer needs. It is a centralized Telephone based service which is flexible for the company to adjust the staffing to match the call volume and customer needs. Technologies used in each Call Centre differ widely. In inbound Call centers often make use of automatic call distribution, in which the incoming calls are assigned to the representatives in the order which they receive. Other Call centers make use of the technologies like Call monitoring where the customers call are monitored by the Quality assurance staffs to ensure their staffs meet the requirements of the clients. 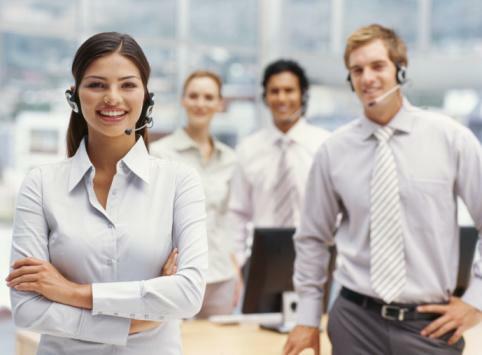 Call centers have been increasingly popular nowadays as Outsourcing is increased. Outsourcing means, where the businesses need expertise or any other skilled person out of their organization to solve their constraint or problem. Going “Out” to find out the “source”. You might be sick trying so many “Work from home business”. But have you ever thought that you can start a Call center business from home and run it successfully? This idea can be great when you decide to implement it. While the possibilities for making money are endless, if you are ready to put some hard work, you can successfully launch a Call Center just being at your home or from any outer area. Call centers use wide varieties of technologies to allow them to manage large volume of work. Each technology has its own importance, and decides how each call can be managed, queued, processed as quickly as possible resulting in good level of service. Data centers: A secure and separate room for holding the computer server and other devices. Meeting room: Rooms for conducting meetings. Lunch room: The place where your employees can spend leisure time. Call centre needs to have two types of connectivity to the outside world. Normally, Call centers take an International Private Leased Circuit (IPLC) from the client’s place to their location to terminate the calls. If the call centers need to have the Primary Rate Interface (PRI) channel, Call center has to be in the location where the PSTN provider can provide these digital high-speed links. Check for the important factors like power connections, transport facility from the office, proximity to the emergency services like fire and police, etc. Draw a site layout, before you set up a call center. Check out the following factors which are very important. Check out the topology you are going to lay out at your office. Most important topologies are Star Topology, Mesh Topology. The right topology must be decided according to the space availability and number of seats that have to be provisioned. Check for the necessary equipment’s for starting a call center. Computer networks must have its own best quality to handle the appropriate number of network connections. Thus, while you draw a lay out, allocate special space for the training process in the layout. This is most important thing in a business. This will bring many new clients to your company. You can advertise through online sources or any marketing sources. Thus, you can effectively make use of these step by step guide to start a Call Center. But be sure to conduct a research on the city or the place where you are going to start the Call center. Also remember, running a call center in an area with low-cost of living will help you to make better wages. Glad you like this post. Sharing is Caring. Do share this post and make it useful to others. Thanks in advance. Subscribe Here to get latest updates within your inbox. Very Nice Post about “Nirmal Anandh” about Call Centres! Most of youngsters start working in Call Centres so this post best for everyone But specially for Call Centres works & young boys & girls those want to work Call Centres. Thanks Admin!!! Thanks for your kind words. Yes, this will be surely useful for the youngsters who working in the call center and also for the person who interested in starting a call center for their own. Hope to see you back again. Keep coming. Glad you like this post. You can contact me here. Keep coming and am very sorry for the late reply. Now a days there are so many predictive dialers and hosted PBX available for call centers. I think these VoIP software really help inbound/outbound call centers in terms of money and service. Such an informative article. Starting a call center is quite tedious but having the right points and right tools will be all worth it. Anyways, awesome blog. Looking forward for more.